New to digital scrapbooking? Never downloaded a digital kit before? What in the world are .rar files anyway? Get your answers here: How to Unzip Files So You Can Digi Scrap. (Also applies to any compressed files, like this artwork). 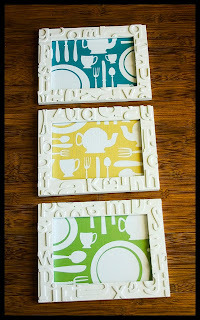 A while ago, I did this tutorial with the alphabet frames. I put this digi art work in it. It's pretty simple, as they print up as 5x7s. Thought I would share with you, if you like. It would be really easy to change the colors on these, because they are just two colors each, so you could easily use the paint bucket tool. Wouldn't they look fabulous in reds and yellows? Or maybe even black and white?